Advise Council of RTA intention to proceed with the extenson of the 80 kph speed zone to Cargo. 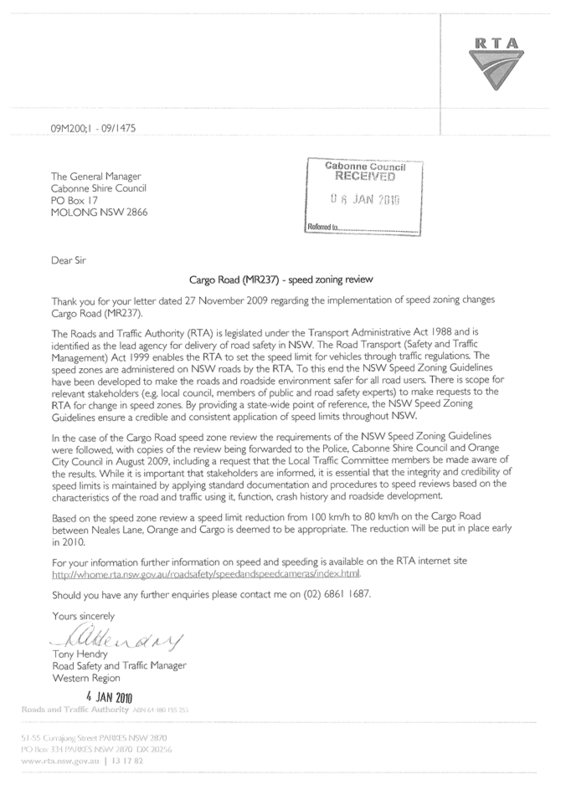 Council would be aware the RTA has undertaken a speed zone review on the Cargo Road between Orange and Cargo. Based on the results of this review the RTA has advised intention to implement an 80 kp/h speed limit for the section of Cargo Road between Orange and Cargo. 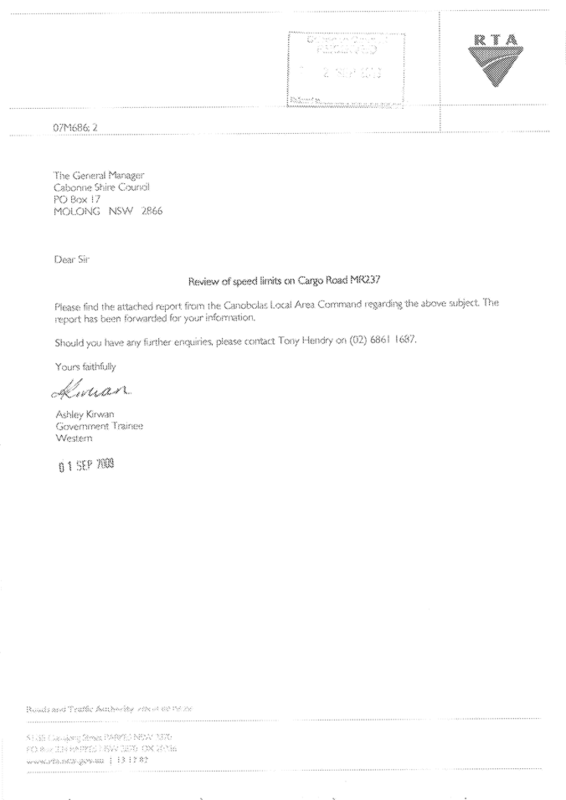 Council submitted an objection to the implementation of the speed limit requesting community consultation be undertaken before any action is taken. 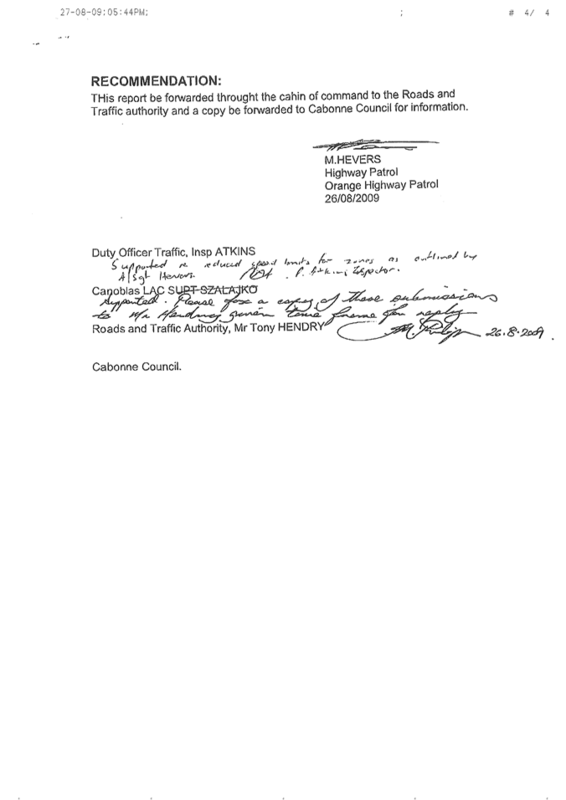 A letter has also been sent to the Minister for Roads advising of Council’s concerns. 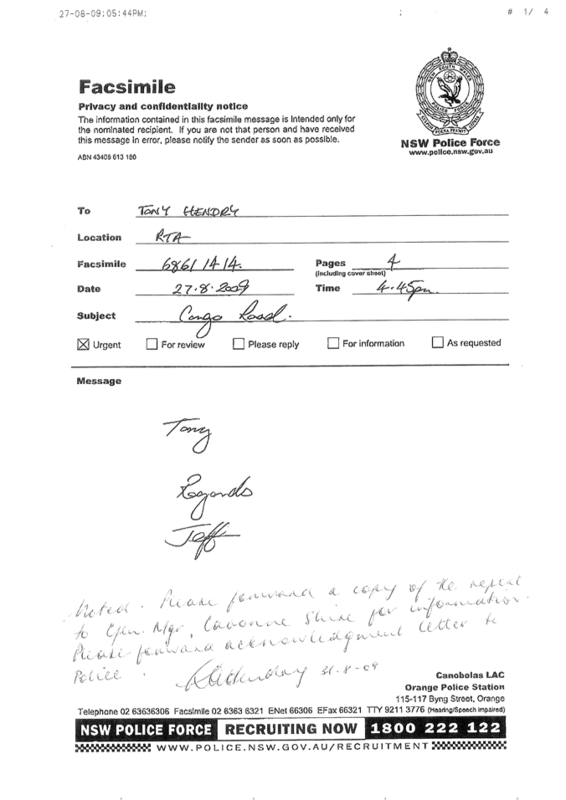 Letters were also sent to Councils affected by this review, including Cowra, Orange and Weddin. Response from these Councils has been positive supporting Cabonne Council’s stance. It is also noted that the Superintendent of the Canobolas LAC submitted comment on the RTA proposal. 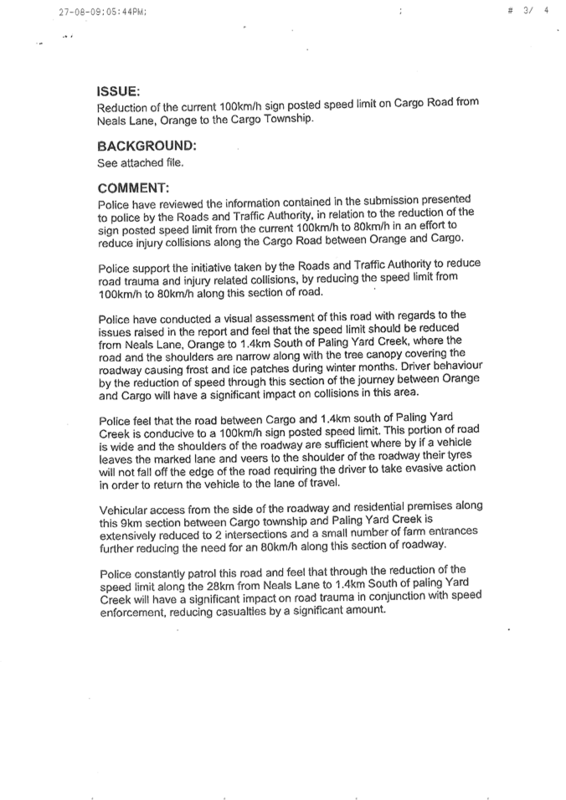 The police support the extension of the 80k to Paling Yard Creek (about 9 kms east of Cargo) however suggest the remaining section of Cargo Road is conducive to 100 km/h speed zone noting the road alignment and road widths improves from this point. 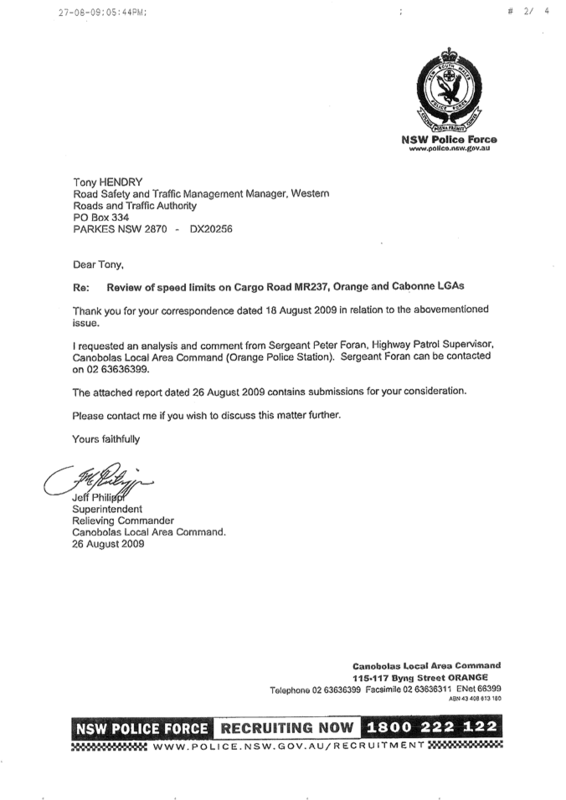 Council received a letter from the RTA dated 4 January 2009 advising that based on the speed zone review the speed limit reduction from 100 km/h to 80 km/h on the Cargo Road between Neales Lane Orange and Cargo is deemed to be appropriate and that the reduction will be put in place early in 2010. The results of the speed review would seem to justify the extension of the 80 km/h limit west from Orange, through Nashdale, based on road alignment, width and conflict with access points. However the road alignment and width improved significantly as you approach Cargo and the 80 km/h limit would seem to be inappropriate. In this instance Council would support the view of the Canobolas LAC. 1. Reply to the RTA letter expressing Council’s disappointment with proceeding without further consultation, especially in the light of the Police comment. 2. Suggest that the 80k speed zone be extended to a point west of Nashdale, to be determined in consultation with RTA, Police and Council staff as a trial (say six months). 3. Police to monitor driver behaviour during trial period. 4. Council to place traffic classifiers to record vehicle counts and speeds. 5. Matter to be considered by Traffic Committee at end of trial. 6. Send copy of letter to the Minister for Roads.